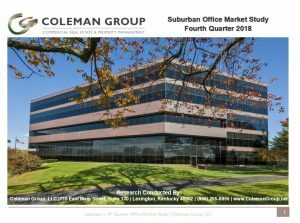 Coleman Group » 2018 Suburban Office Market Study Now Available!! 2018 Suburban Office Market Study Now Available!! The Coleman Group is pleased to offer this in-depth analysis of the Suburban Office market in Lexington, Kentucky. This study is produced on an annual basis and is the most detailed study made publicly available in the region. Please click the image below to view the study. Contact Coleman Group Property Services for all your commercial real estate needs.